I picked this word because it is one of those homonym things, or maybe a homograph: I can't really be sure which because I no longer have my big Reader's Digest book of grammar. I miss that book. The first weekword I ever participated in was a homony...gra...pho.... one of those words that has several different meanings. I still remember reading all the different interpretations and how much I enjoyed it. This word had the double bonus of allowing me to read lots of reasons to be cheerful, which is perfect for a Friday. Coupled with the many "I'm thankful for..." posts coming from the other side of the pond, there has been a lot of positivity in blogland this week. I've always thought of content, the adjective, as a really positive word. When you don't want any more, and you have enough, then you are content. It's something to aspire to. There was a thread about it once, though, on my favourite forum, and one response was along the lines of, "I hope I'm never content because then I will have settled." For a while my perception of the word changed a little. Was it not a positive word, then? Was it like that word that makes every British teacher's bum clench in horror - "satisfactory"? But after a while I decided that it was much better to be happy with one's lot than to constantly think all one has achieved is not enough. 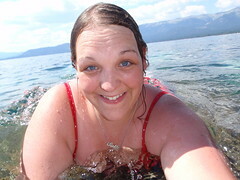 I was pretty content here, swimming in Lake Tahoe. That doesn't mean my appetite for swimming in freshwater lakes had been whetted; but it's important to take the time to enjoy the moments when you have achieved exactly what you want, n'est ce pas? I wouldn't have wanted to spend my Tahoe time floating on my back, thinking about my next swimming experience. Contentment, I think, has to come from pausing for breath and thinking about all you've managed to achieve. Taking a picnic part way up that mountain so you can enjoy the view, so to speak. I don't think there's any shame in that. Here's where I'd suggest you go and smell the roses but, well, it is November. Enjoy this picture of roses in my wedding bouquet instead. Definitely one of my most content days to date. Who's doing next week? Shall I pick or does someone want to volunteer? I thought I'd put my name down. I've posted already. Could you put me on please. Great post Sally and definitely a word to think about. So much fun to participate! Thank you so much for hosting! 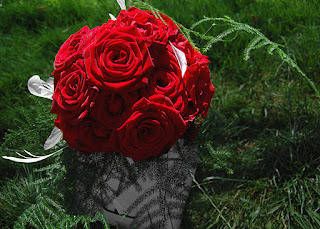 :) Wonderful choice!